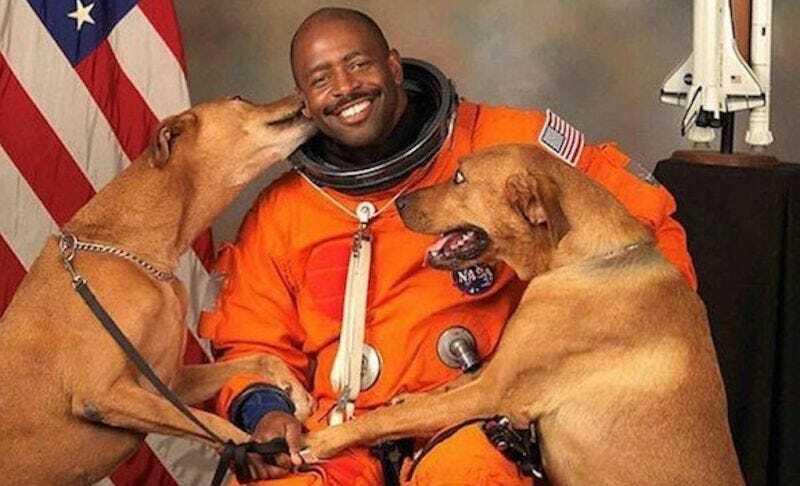 Leland Melvin is a unicorn of a human being. He’s been drafted to the NFL, flown in the final frontier (twice), and now, written a book called Chasing Space. On the internet, the former NASA astronaut is best known for this unforgettable photo with his two dogs, Jake and Scout, who grace the cover of his new memoir. Gizmodo sat down with Melvin to talk about diversity in STEAM fields, education, and of course, Good Dogs in Space. We also danced to Pitbull—twice. Below is a lightly edited and condensed version of the interview. Rae Paoletta: Why is your life so cool? Leland Melvin: My life “cool”? What are you talking about? RP: Uh, you’ve been a football player, an astronaut—that’s like every kid’s dream except maybe Jurassic Park dinosaur wrangler. LM: I never planned any of this stuff, it just meandered to these spaces. A lot of people had my back and said I could try different things. The actual space thing was never something I imagined doing. Ryan F. Mandelbaum: I still wanna know how somebody plays football and goes to space. How does that happen? LM: There was a lot of work, a lot of discipline. I’ve been playing football since I was in fifth grade. So it was all those years of preparation and the joy of repetition. Then I was in a high school game and I dropped a touchdown pass in the end zone and I thought my coach was going to yank me out by my face mask. He said, “Go back in and catch the ball,” and I went back in and caught the ball, and that got me a football scholarship to the University of Richmond. That showed me right there that if you don’t give up—with grit, perseverance, determination—you can do great things. That’s my journey, like the little engine that could, you know? RFM: When did you know that you wanted to become an astronaut? LM: The 1996 astronaut class of “sardines”—there was 45 of them, they were all together like sardines. When my boy got in, he flew back to NASA Langley where I worked with John Young—John Young walked on the Moon. So one day, I’m talking to John Young and he’s like, “Leland, you should apply!” And I’m like, “Well John Young says I should apply, so I guess I should apply,” so I applied and I got in. I think this was 1997. 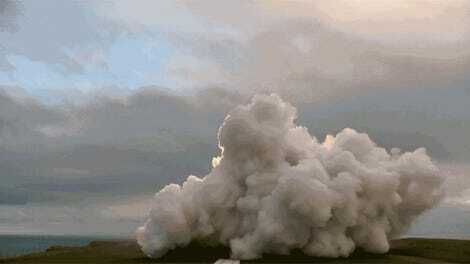 RP: Obviously, becoming an astronaut is the coolest job ever, but it’s very difficult. What was the biggest challenge you faced? LM: I was in this training accident. One day I put on my white Michelin Man-looking suit to go down in this 6-million gallon pool to do spacewalk training and they forgot to put my pad in there—it’s a Valsalva pad, a pad to press your nose against to clear your ears. Mine wasn’t in there. So I couldn’t clear my ears, I lost my hearing, there was blood coming out of my ear, and to have to lose a sense—my brain had to rewire itself to hear again. I didn’t know if I was gonna fly again, or fly at all. Then, things just started happening and I got better and I got that chance to fly. RFM: You’ve been doing a lot of awesome work with your advocacy for diversity in STEAM. How do we get more women and people of color to space? LM: Well first of all, you do exactly what you’re doing right now. On this camera, you’re showing a brother with a flight suit on that’s been to space. So maybe there’s a little kid out there who looks like me and goes, “Hey, he did it—I can do it.” It’s a media thing, getting more of that message out there. I said, “No, I’m not, I’m gonna work for DuPont or Dowd.” And she was like, “No, you’re coming to NASA.” She had authority to hire me on the spot because they were trying to get more diverse, and that was in 1989. Research shows that the most creative and elegant solutions come from the most diverse teams, of different races, genders, I mean, every way you can think of diversity you get the best solutions when you have that team together. I think making people feel welcome—no matter what they’re coming to the table with—starts with having a boss who appreciates your talent and your value. RP: So to pivot, books! You just wrote one, it’s called Chasing Space. What were some things that stood out to you when you reflect on it? LM: I think one of the biggest things was my parents. When I retired from NASA, I moved home to be with my father. I’d been with NASA for 24 years...I had this one conversation with my dad, and he passed the next day. My identity as an astronaut, as a civil servant, just got eroded when that whole thing happened. And then I started finding out all these stories from people in the neighborhood—they told me “your dad kept me out of jail,” or “your dad bought me a car when I got out of rehab.” And so if I hadn’t been there at that time, I wouldn’t have heard all these stories that I put in the book. It was about people helping people do better. And now I feel it’s my job to go out and inspire kids to go out and do whatever they want to do, and a lot of that I got from my father. RP: Speaking of kids and education, if this new fiscal budget is approved, education departments within NASA will take a major hit. How can we continue to inspire kids despite the political climate? LM: I think you have to get kids connected to doing something not just for the sake of doing it, but to help save our planet. How can someone help you or your cat not have a fur ball, for example? Whatever it is, they should have this perspective about helping other people. Having this orbital perspective as someone coming back to the planet from space, I see how we’re so connected and I want to relay that to kids. LM: How does it make you feel? RP: It makes me feel like sunshine? Like rainbows and unicorns are exploding in my brain. But you stole my question—how does it make you feel seeing that photo? LM: It’s funny, I see that photo every day now since it’s on the cover of the book. The thing I didn’t realize at first is...it’s our hands: the two paws and my hand are all connected together. It’s like we’re doing a low five, feeling all this love. That’s what I felt really good about—all our hands. RFM: Just three good boys. LM: Three good boys kickin’ it. RFM: How do we get those good boys to space? I want a dog in space. LM: Well, with the commercial sector—Elon Musk and SpaceX—you might be able to convince him to let you go up with a couple of your boys. RP: So you’re telling me a Martian cat colony is not out of the question? LM: Cats? [Scoffs] I love all animals. No hating on the felines. But there’s nothing like a dog up there. RFM: My dog would throw up in space. RFM: I just know that’s the first thing he would do. I’d throw up in space too. LM: I didn’t feel sick in space, so it was weird. It was so sudden. I had a bad ham sandwich, I think that’s what did me in. RP: So now we’re just gonna ask you some dumb questions. What’s your favorite Pitbull song? RFM: What’s your favorite kind of cheese? RFM: Should Pluto be a planet? LM: I think so because there’s another planet that’s in our solar system...something that can be defined with those rules [from the IAU], and we’re gonna find more planets in our solar system that we’re gonna have to figure out what to do with. So Pluto should be a planet. RFM: There’s still so much stigma around being either a jock or a nerd, and obviously, you’ve completely destroyed that. How can you be someone who loves space and also sports? LM: Historically, it’s always been the nerds helping the jocks with their homework. They don’t want admit it, but jocks need the nerds. There are a lot of people who have the mindset that they can only be a jock or a musician or a mathematician, but when you think about it, math and music are the only true absolutes that use both the right and left side of the brain. We need to break down the barrier that you can only do one thing. We have to instill growth mindset in kids’ heads, because math and creativity are so intertwined. RP: Is it cool to be a nerd? LM: Nerds are the bomb. I mean, you have the knowledge, you have the understanding of how things work in the world, and you can help influence others with the knowledge you have. The way we can all be cool together is if we’re a collective, and working together to impact the world in a better way.